Mid-morning, October 9, 2017, my cell phone started dinging with notifications like never before. One right after the other, slightly muffled from being in a pocket inside my purse. I ran to retrieve my phone, thinking there may be an emergency situation happening at my boys’ school. 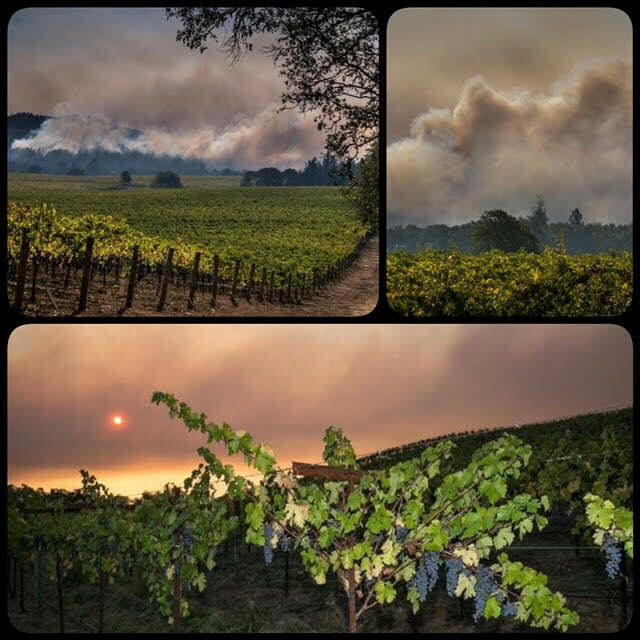 Once I had my phone in hand, I was instantly stunned by unbelievable photos and texts from friends: California’s historical wine regions of Sonoma and Napa were ablaze, and people were fleeing from their homes with nothing but what they had on their backs. Since the moment I picked up my phone, I’ve been unable to escape the images and stories that continue to flow through my social media feeds; I never imagined it would get this bad. 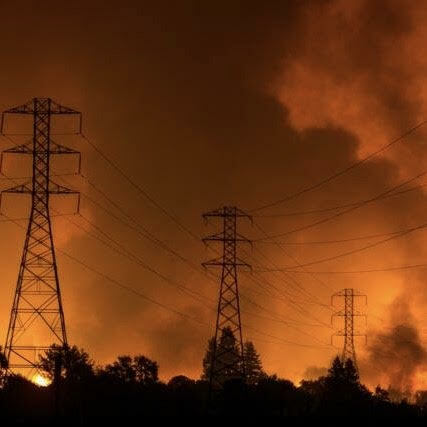 At one point, I read the fires were moving so quickly, they were burning an entire football field’s length in three seconds – a blazing speed that is truly difficult to comprehend. Feeling helpless is intensely crushing; however, many of us can help. As the Wine Buyer at 16 Tons Beer & Wine in downtown Eugene, Oregon, I’ve pulled all of the Napa and Sonoma wines from the shelves (and displayed them front and center) in an effort to encourage wine shoppers to support wine country’s continuing losses by purchasing wines from the affected regions. I sincerely hope that other wine shops around the country will do the same. More importantly, California wine industry and association leaders Michelle McCue of McCue Marketing Communications, Ann Petersen of Winegrowers of Dry Creek Valley, and Megan Metz of Santa Cruz Mountains Winegrowers Association are banding together to create a network which provides aid to the growing number of victims in the California wine community. 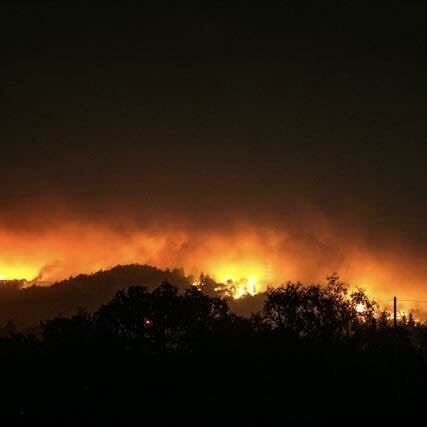 Early afternoon on Monday, George expressed his concern, “WINE COUNTRY ABLAZE! 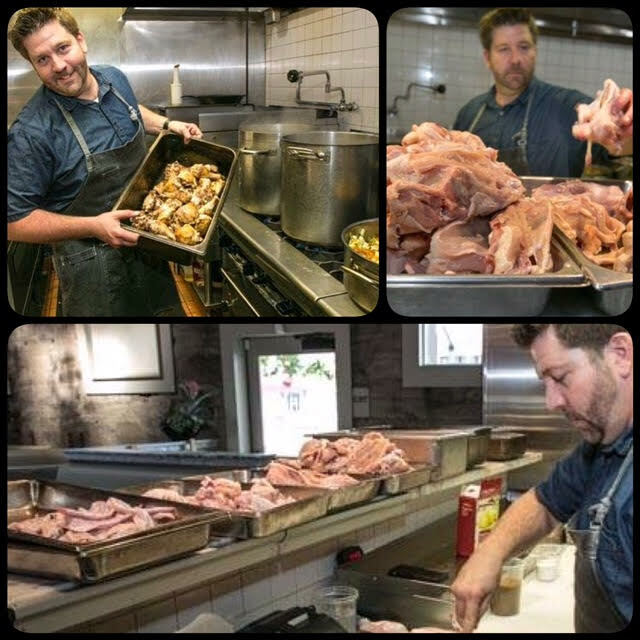 Efforts include fundraising and creation of an online resource where vintners can find and offer resources, such as generators, trailers, lodging and manpower. 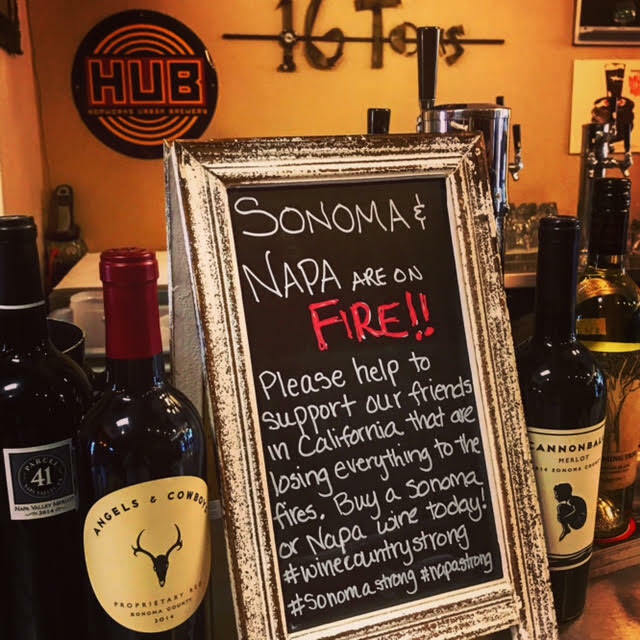 This support network provides immediate assistance and long-term aid to victims of the fires ravaging Northern California, and they are calling on the national wine community for additional help. 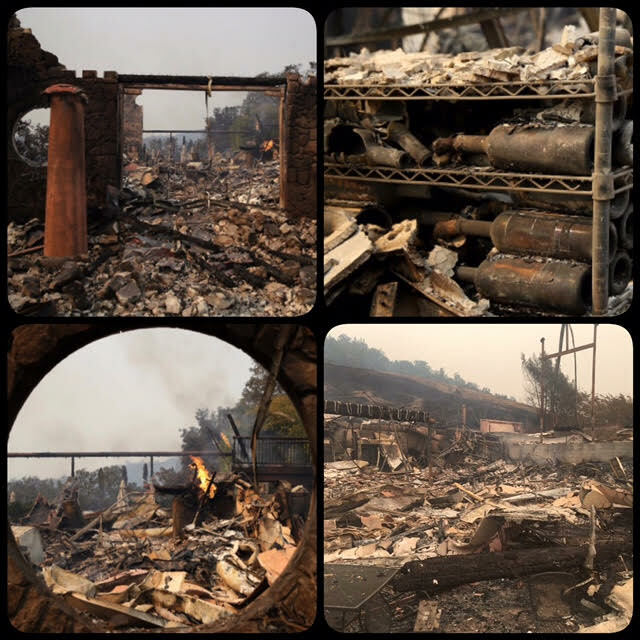 Various photos gathered from Facebook show total devastation to wineries in the region. 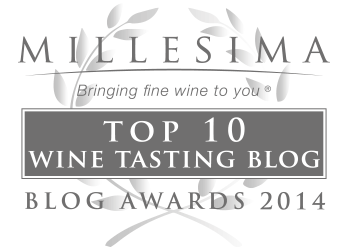 Pictured are Signorello Estate and Paradise Ridge. The group has created an online form where supporters can list available resources and provide contact information. Resource and contact information will be shared only with members of Sonoma, Napa and Mendocino winegrowing and vintner associations. Click http://bit.ly/2wNVda0 to offer resources. 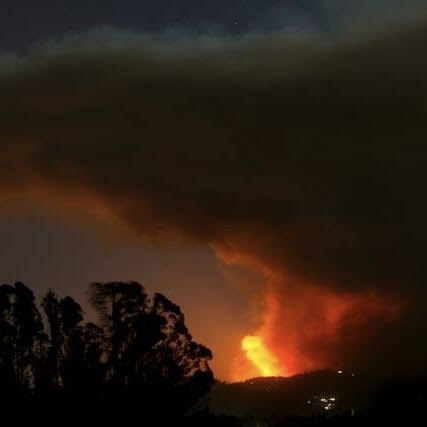 Organizers have created a statewide fundraising campaign called CAWineStrong, and online donations are being accepted at CAWineStrong.com (no www. ). 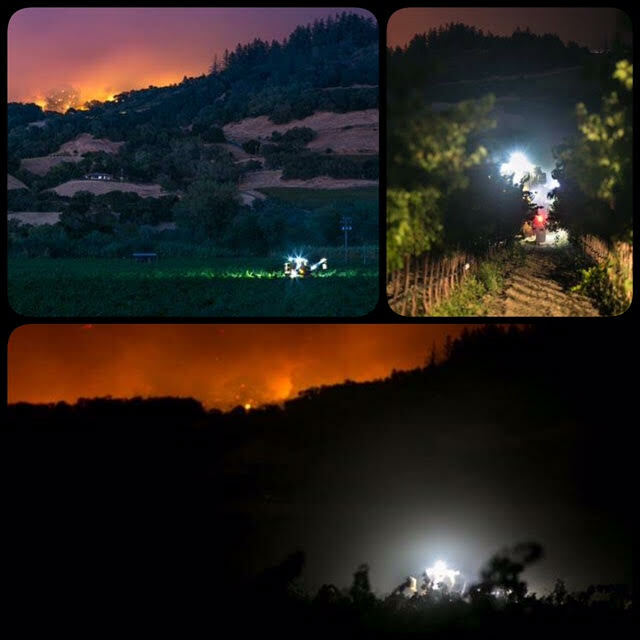 All cash raised will be divided amongst Community Foundation Fire Relief Funds in Sonoma, Napa, Mendocino and Yuba counties. Since Tuesday afternoon, more than 150 people have signed up to offer ground-level resources, including trucks, medical aid and supplies, tank space and crush facilities, housing and even offers to pick up and transport people out if they’ve lost their vehicles. 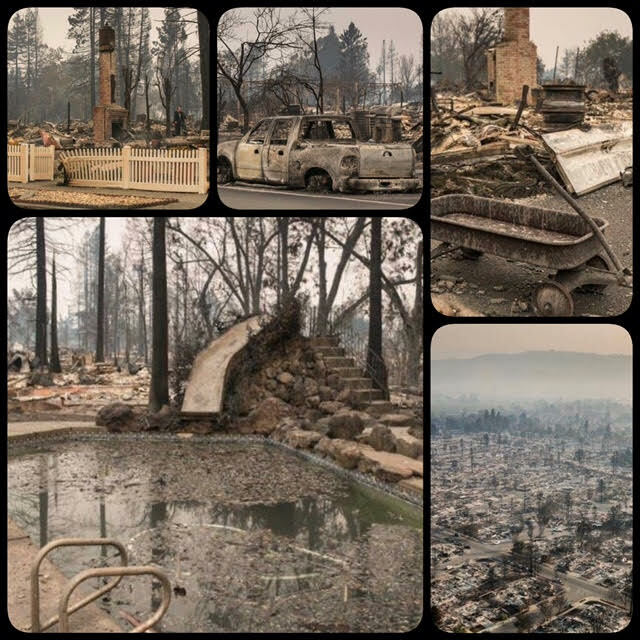 A special thank you to California resident and captivating photographer, George Rose, who shared many of his emotionally striking photos he has captured since the tragic California fires broke out on Sunday evening. George is a contributing photographer at Getty Images and owner of George Rose Photography.